ReNew Power Archives - Solar Love! 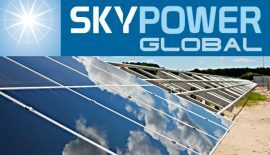 Home Tags Posts tagged with "ReNew Power"
At least three major renewable energy developers in India are looking to buy the seven solar power projects awarded to SkyPower Global as the Canadian company plans to exit the highly competitive market. SkyPower Global was awarded three projects of 50 megawatts each in the state of Madhya Pradesh and four projects of 50 megawatts each in the state of Telangana. All these projects were awarded through competitive auctions under state solar policies. We had earlier reported the problems SkyPower has been facing with one of the solar power projects in Madhya Pradesh. The company failed to commission the project by the deadline of January 2017 due to lack of enough land for the project. The state government-owned company that was supposed to acquire power from the project refused to sign a power purchase agreement for the project and instead encashed the bank guarantee pledged by SkyPower. SkyPower has challenged these developments in a court. All seven projects were secured at the lowest solar power tariffs at that time. Media reports suggest that the built quality of the projects is very good, which has attracted the likes of ReNew Power, Greenko Energy, and Hero Future Energies. The plants are being constructed by Sterling & Wilson, which has also commissioned projects in the Middle East and Northern Africa. While ReNew Power and Greenko Energy have the backing of major international investors, Hero Future Energies is part of a major Indian industrial conglomerate — Hero Group. Greenko Energy acquired 1,300 megawatts of capacity awarded to SunEdison India after the latter’s bankruptcy. ReNew Power has also been looking at several potential acquisitions as it preps for its initial public offering. Hero Future Energies has been participating actively in several competitive auctions and would like to increase capacity under management. In 2015, SkyPower Global had pledged to set up 9.9 gigawatts of solar power capacity across India. The company has been active in emerging solar power markets that offer significantly higher tariffs compared to those seen in high-competition markets such as Chile, the Middle East and India. The company has signed agreements to develop large-scale solar power projects in countries like Kenya, Bangladesh, and Egypt. South Korean solar module manufacturer Hanwha Q CELLS is all set to enter the emerging Indian solar market through its recent module supply agreement with the local renewable energy developer ReNew Power. Hanwha Q CELLS has entered a joint venture with ReNew Power to install, develop, and operate two solar projects with aggregate capacity of 148.8 MW in the southern Indian state of Telangana. As part of the deal, Hanwha Q CELLS will have 49% equity ownership in both solar projects. According to the agreement, Hanwha Q CELLS will supply and install 477,000 German-engineered modules to the solar power projects located in the Medak and Mehbubnagar districts of Telangana. The module shipment will commence from August this year, with scheduled completion by next year. Both the projects are expected to be commissioned in June 2016. The power generated from the projects will be sold to Southern Power Distribution Company of Telangana (TSSPDCL) through long-term power purchase agreement. ReNew Power has already established itself as one of the most promising renewable energy developers in India with a 1-gigawatt portfolio of commissioned and under-construction renewable energy projects all over the country. Earlier this month, ReNew Power also announced an investment and supply deal with Hareon Solar for a solar power project in Andhra Pradesh. Hareon Solar will invest in and supply modules for a 72 MW solar power project.